As was typical in the 1920's, the focus was on food being digestible, a result of the work of Dr. Gautier in France who really started unraveling the mystery of calories and food nutrition. 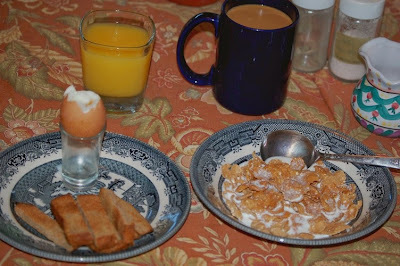 From this we have a shift from the heavy English/Scottish style breakfasts of the late 1800's to a more "Continental" breakfast. Packaged cold cereal became popular before WWI but the proliferation of brands after the war made it a truly 1920's phenomenon. 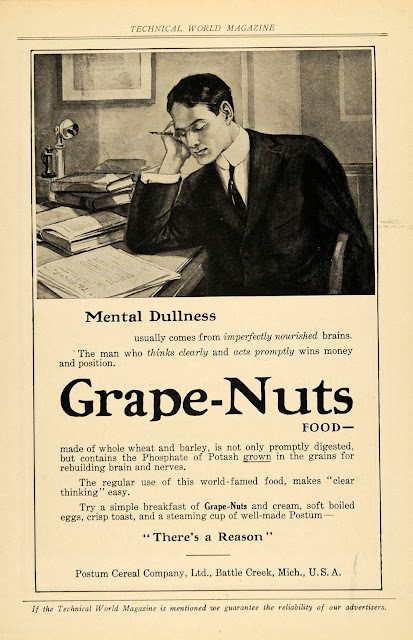 From these old ads for breakfast cereals we can get a look at what constituted a decent, nourishing breakfast. Now, finding breakfast cereals which are the equivalent of what was available back in the 1920's can be tricky indeed. It's not enough to just choose organic because even the organic cereals have fallen into the syrupy, sugar pit of oversweetened garbage. Cereals in the 1920's were Corn Flakes, not Frosted Flakes; Shredded Wheat, not Frosted Wheat; Etc and so forth you get the idea. We eat too much sugar in the country which has been the true dietary problem for decades, not fat consumption, sugar consumption. So the cereal I chose, although lightly sweetened is very much in proportion to what cereal in the 1920's would have contained. Better yet it has no added vitamins. Yes you read that right, I hate (with a passion unrivaled) vitamin fortified foods. Those so called vitamins are nothing more than chelated chemical impostors garnered from industrial waste and the salt mining industries. Your body doesn't know how to handle them and either purges them or worse yet stores them where they become oxidants that cause problems in the long run. As for the rest of the items they speak for themselves. The coffee is French Market, you know my love of chicory coffee, the only thing that would not have graced most breakfast tables back then is surprisingly, the orange juice. Commercial bottling of orange juice was limited to the areas where oranges were grown. So outside of Florida and California you would have squeezed your own. Since I live in Florida I can indulge in some morning OJ especially since I'm so in love with the Indian River brand that we can get down here. I used to live in FL...I miss Indian River oj!